Anything with very dark chocolate, especially See's and Lindt Excellence with Chili - yummm! REESE'S PEANUT BUTTER CUPS !!! Something tells me you REALLY, REALLY like reese's peanut butter cups! They are sooooooooooo delicious and they are so slickery in your mouth. Yum! Real licorice, the black stuff. What is really good too is the licorice made with sal ammoniac. It has a tart ammonia flavor and essential scent that wafts up into your sinuses ...Yum!!!!!!! After giving this subject much thought I find I have many favorites depending upon the catgory. Oh, the crunchy, chocolatey goodness. 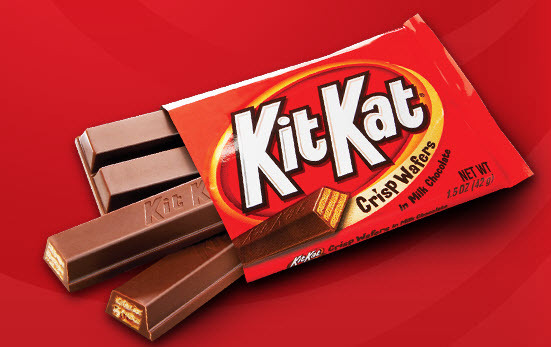 Don't cha just wanna "break yourself a piece of that Kit Kat bar?" Yeah, that's taken from the jingle in the Kit Kat commercial.